No one really knows Google’s page ranking algorithm. However, Search Engine Optimization (SEO) companies try hard to get you to spend money with them in order to increase your page rank and results within a search engine (Search Engine Results Page or SERP). I had a very interesting conversation with Shawn Bishop, CEO of RankPay the other week. RankPay is a SEO service that has a different take on ranking your website, which I thought was very compelling. According to Shawn, the company decided to flip the model; you don’t pay if you don’t get ranked. First, a quick primer on page and website ranking. Google’s PageRank is a score from 1-10. The higher the rank, the more credible your site. According to Justin Phillips, Director of Operations at RankPay, “PageRank uses the web’s vast link structure as an indicator of an individual page’s value. In essence, Google interprets a link from page A to page B as a vote, by page A, for page B. But, Google looks at more than the sheer volume of votes, or links a page receives; it also analyzes the page that casts the vote. Votes cast by pages that are themselves “important” weigh more heavily and help to make other pages “important.“” Of course, a site can have a high PageRank and not be ranked within the top 1000 positions of a search engine for any search terms. You want your URL to also rank within a search engine result page (i.e. what you see after you search for a keyword(s)). This is where RankPay comes in. So, how does it work? All you do is go to the RankPay homepage and put in your domain name. RankPay will first provide you with your Google PageRank. Next, you enter in the key words you want to be ranked on. For example, say you’re a provider of business analytics services. You might enter data analysis or business analytics or predictive model as possible key words. RankPay uses its own algorithm to tell you the SEO opportunity and how much it will cost you per month, IF RankPay is successful. Here is a screen shot from the service. I input a company name (sorry about that, companyx, whatever you are) and the key word, “predictive model” into the system. RankPay tells you if you are ranked within the top 30 for the big 3 search engines, if the SEO opportunity as either Good, Very Good or Excellent, and how much it will cost you per month if you’re ranked. Here the opportunity is excellent and it will cost me $157 a month IF Google ranks the site in the top three websites within a search engine results page. 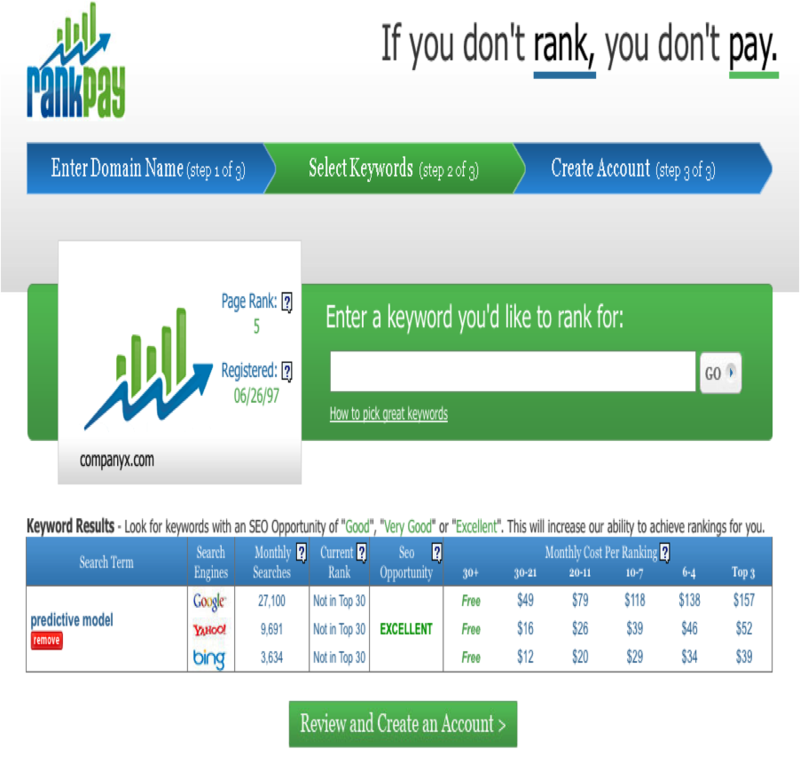 The idea is that RankPay takes only those sites/keywords where it thinks it can get ranking. Otherwise, it would put a lot of effort (think about contacting other sites for links, increasing content, bookmarking, etc. that is involved with increasing rank) for no reward on either end. So, if you’re a new company with a low Google page rank and you want to get ranked on popular key words, RankPay may not take you as a client. It will however, suggest other key word combinations that might make you a better candidate. The proof is in the pudding. If you go to Google and search for “SEO services” RankPay shows up in the top 3. It’s a neat little model and they appear to be successful. The service apparently converts 1 in 20 companies that come to their site. That’s good news for the company. ← Do we need the semantic web? Those are really good SEO points you are raising. Thanks, will keep them in mind.